So this just happened. Picked up a brand new 2016 YZ250FX fresh out of the crate for dirt cheap. I had to drive all day to get it but it's the best deal I have ever got. Being a big guy at 6'2" 220, I was on the fence about getting a little thumper. I was stressed out and questioning my decision for a week or more and thinking I.was too big for it. You see I have always been a 250 2stroke guy. Yeah sure I have had all sorts of bikes, brands, models, and sizes with a few 4strokes thrown in here and there but a 250 smoker has always been the weapon of choice when going up against experts in hare scrambles. After cleaning rotors, charging battery, and doing the fluids; I fired the 250FX up. Man, she sounds good. I warmed it up a while, spun the idle out 8 clicks and yook off down my driveway. Holy Crap!! 4strokes have come a LONG ways. This thing rips!!! I only tried it on my street for a few mins but I have to say that I am shocked at what it has for power. This thing is gonna be awesome for eastern USA riding. 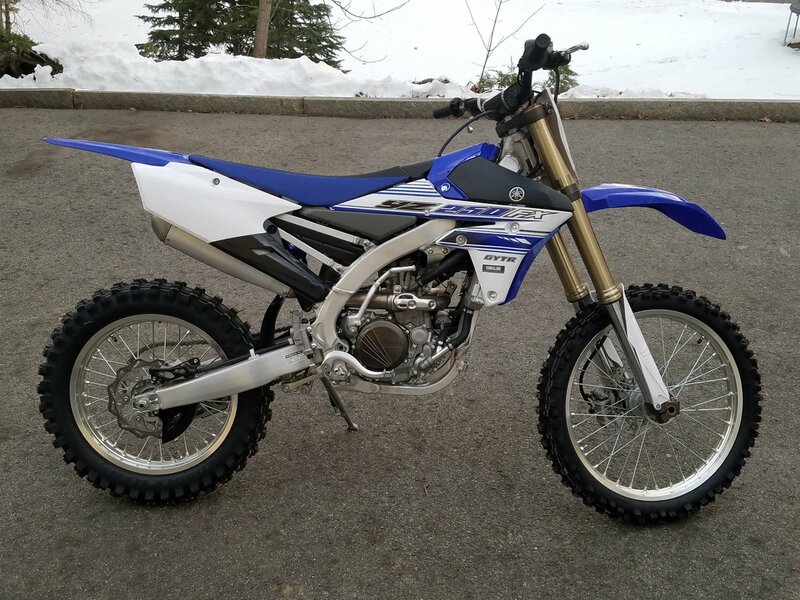 I am absolutely stoked that I chose the 250 instead of a 450. I really cant stress enough how good the bike feels. Yeah i know, its just a seat of the pants driveway review but I am a good expert and have had a ton of bikes. I know this thing is gonna be great. So pumped. And she looks good beside my 250X. I have always been a 2stroke guy and will always have one in my garage, but I truly feel as though this bike is going to be very easy to ride fast and great in the New England terrain I ride/race in. I will be posting in here on a regular basis as I know nothing about these bikes. Right now I am lookimg at the Acerbis tank because I like that the gas cap is exposed just worried about if the opening is small for filling? Also curious about gas mileage? Also, it doesn't look like there is enough room to put a steering damper post on it? Is the 17 frame different near the pegs or does the 17 just have lower pegs or different brackets that lower the pegs??? I may want to lower the pegs or go to the 17 setup if I can. When adding a headlight, is the plug for it there or do I need to run the wires myself? I have always run NoToil air filter oil, is it ok for 4bangers? Whats the deal with the wire coming out of the clutch perch? I want to put a YZ250f cable and MSR perch on it as I hear it makes for an easier clutch perch. Can I do.away with the safety feature wire without any issues? Will my 2stroke rear wheels fit? I know the front is different. I dont like how the rad scoops stick out. I heard that some guys with 450's do a mod to tuck them in, any info on this would be appreciated. Are these rad shrouds the same as 250f ones or the same as 450f?? I know about the first oil change being quick and will do it when I get 45 mins or so on it. Congratulations! I just picked up a 17 FX today myself! To answer a few of your questions. Gas mileage is great. Only 2 gallon tank but I easily get 60 miles on hard single track. For long rides I sometimes carry a small gas bottle in my back pack, but have never needed it but I'm a light guy at 160 lbs. I run a Trailtech X2 headlight and like it. I use a wiring harness with a three position switch run to the battery. It also provides power to my Trailtech Striker computer, which I also like (speed, distance, engine temp, battery volts). I've heard of people tapping in to the FX's wiring harness, but I don't think it has the WR headlight connections. The WR skid plate is a good choice and I rivet an extension on it to block mud getting in between the front main frame triangle. Yes, the rads do stick out a ways compared to other mfgs. Unibiker rad guards are great protection for a good price. The WR radiator fan is a must - plug and play and inexpensive. If you get a fan, make sure to tell Unibiker you have a FX with fan, as the guards for the F don't provide room for the fan. I run Tubliss and think it is probably the best mod available to dirt biking in the last 10 years! My area in the NW still has way too much snow, but when we start riding again, I will post the differences of the 17 FX vs the 15 FX that I have had for 2 seasons! Congrats on the bike!! I can answer a few questions for you. 17' foot pegs sit 5mm lower according to multiple sources online. Clutch safety switch. It can be removed and you can add a jumper wire at the 2 wire plug. Allows you to start the bike without the clutch pulled in. If your talking about the Acerbis 2.9 gallon YZf tank it can be made to work. But this is what you will need to do.